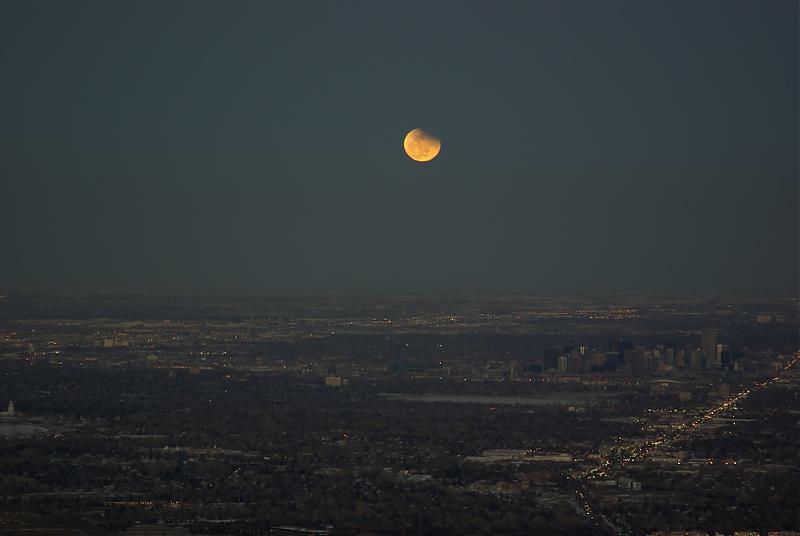 When the moon rose in Denver it was almost out of the umbra but there was still a little sliver missing. This was taken from Lookout Mountain just west of Golden, CO.
Last edited by Mark Castleman; 03-05-2007 at 09:45 AM. That Lookout must be really high. yea, theres alot of light pollution. You really have to drive out to the rural areas to get good star pics and in this case, the eclipse. I was caught at an indoor pool party, so I missed the opportunity to shoot. Anyways, I'll agree with Chop and Pete - way too much cloud cover in Toronto area. It's not that Lookout Mountain is that high (it's about 7000 feet) but rather that Denver sits in a depression and the mountains begin quite abruptly just west of the city. Many people driving to Colorado from the east are surprised to find that the eastern 1/3 of the state is short-grass prairie and quite flat. All times are GMT -7. The time now is 01:54 PM. | See also: NikonForums.com, CanonForums.com part of our network of photo forums!